'Riverdale' Season One Finale is Headed for 'The Sweet Hereafter"
The CW's hit drama 'Riverdale,' based on the characters from Archie Comics, is about to conclude their first season this Thursday after an explosive episode last week. It'll be hard to top the revelation of Jason Blossom's real killer in last week's “Chapter Twelve: Anatomy of a Murder” episode but there's never any shortage of drama in Riverdale. Undoubtedly, everyone will be dealing with the aftermath causing some more rifts among friends and frenemies alike. The trailer below promises "new secrets" and "new mysteries. "The season finale episode entitled “Chapter Thirteen: The Sweet Hereafter” is written by executive producer Roberto Aguirre-Sacasa who's also written the comic books series and knows these characters better than anyone. It should be one hell of a cliffhanger. SEASON FINALE SYNOPSIS — Archie (KJ Apa) and Veronica (Camila Mendes) continue to grow closer. Betty (Lili Reinhart) is tired of her family acting as if nothing has happened and confronts her mother. 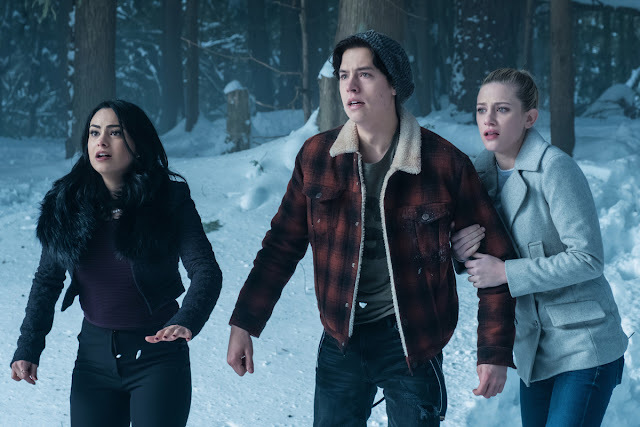 Jughead (Cole Sprouse) finds himself in an unexpected situation, leaving Archie and the gang scrambling. Hermione (Marisol Nichols) makes Fred (Luke Perry) an offer that seems too good to be true. Meanwhile, the truth about Blossom’s family business is revealed leaving Cheryl (Madelain Petsch) to take matters into her own hands. Madchen Amick and Ashleigh Murray also star. Lee Toland Krieger directed the episode written by Roberto Aguirre-Sacasa (#113). Original airdate 5/11/2017. Archie (KJ Apa), Veronica (Camila Mendes), and Josie & The Pussycats (Ashleigh Murray, Hayley Law, Asha Bromfield) perform "Share it with You" in the Riverdale Season One finale! “Chapter Thirteen: The Sweet Hereafter” debuts on May 11th at 9/8c on The CW and May 12th on The CW App and Netflix for viewers outside the United States.